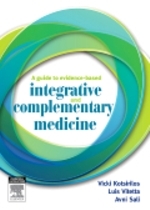 A Concise Guide to Integrative and Complementary Medicine for Health Practitioners is a comprehensive textbook on the non-pharmacological treatments for common medical practice problems, with the support of current scientific evidence. Non-pharmacological approaches include advice for lifestyle and behavioural factors, mind-body medicine, stress management, dietary changes, exercise and sleep advice, nutritional and herbal medicine, acupuncture, complementary medicines and the role of sunshine that may impact on the treatment of the disease's. Only proven therapies from current research are included, particularly from Cochrane reviews and research from systematic reviews, randomized control trials and published cohort and case studies. > Instant access to evidence-based clinical information on non-pharmacological treatments including complementary medicines, for common diseases/conditions. > Instant access to prevention, health promotion and lifestyle advice. > Each chapter of the textbook is summarised based on scientific evidence using the NHMRC guidelines grading system. > One/two page, patient summary sheet at the end of each chapter. > Organised by common medical presentations .